The desire of this home owner was to have no more grass at this home in Hampton Bays. 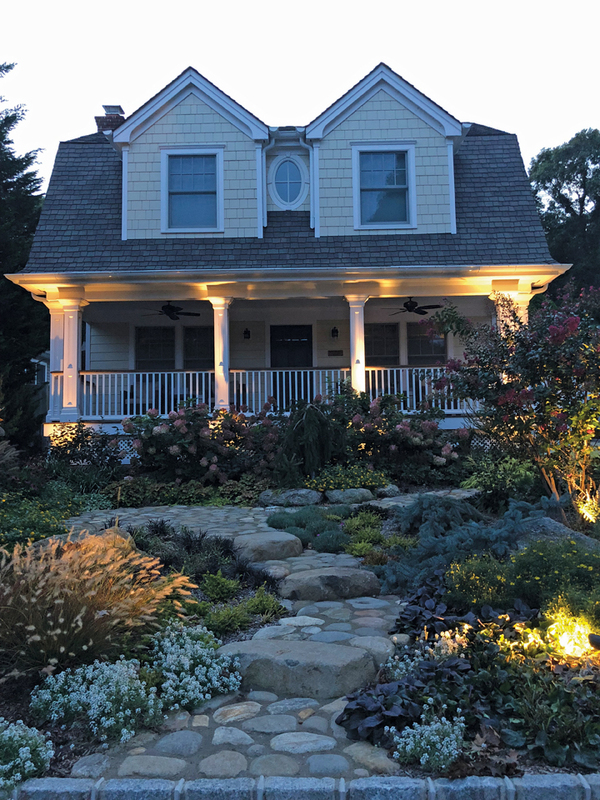 Landscape artist, Eric Hagenbruch, owner of Finesse LandscapeDesign, who has been creating natural landscapes for over 35 years was hired to do this job. The homeowners had just completed a major renovation and were ready for something unusual on the front lawn. Hagenbruch said as soon as he pulled up to this house, he had the idea for a small boulder walkway with a few steps up the hill to a boulder patio which would meander over to the driveway. In locations where there is no stone, there would be trees, shrubs and perennials. The real challenge was convincing his clients. After multiple meetings, the homeowners decided to give Hagenbruch carte blanche! Before the stone walls and paths were to be installed, all the clay soil had to be removed. The new planting beds got a custom compost soil mixture to enjoy their new home in the landscape. “Everywhere you look there are interesting, unusual and fragrant plants,” says Hagenbruch. One of perennials, Allium “millenium” is a butterfly magnet. This allium is interesting through multiple seasons. Magnolia, also known as “Little Gem” has a delicious fragrance when you are walking along the stone paths. This front yard garden was designed to show color all year long. Hagenbruch says with every house he works on his goal is to have color all four seasons. Many plants have foliage that changes color during the cooler months. The homeowners are excited every time they go out to their summer home to see what’s blooming each and every weekend. There is a variegated ajuga ground cover which can take foot traffic along the side of the house into the backyard. It surrounds an interesting natural stone lantern found at Mother Earth’s Nursery in East Northport, New York, which was placed along the path. Hagenbruch says every outdoor lighting project L.I. Custom Design Group does always comes out absolutely amazing. Every year more and more clients are removing their lawns and replacing them with flower gardens and/or edible gardens. These type of gardens, once established, use less water and of course no lawn chemicals.